As part of our strategy to engage prospective travelers through entertainment-based content about the city, we saw the opportunity to capitalize on our audience’s tendency to watch most of their programming online or through digital devices. We wanted to create a digitally-driven series that could tap into their passion for engaging episodic content; and do it in a way that was as immersive and progressive as the city itself. Our objectives remained simple: 1. Share more of Seattle’s story by driving viewership of the show on VISITSEATTLE.tv on YouTube. 2. Drive engagement around the show – including social spread and conversation. Ultimately, these behaviors could lead to filling more rooms, more often: the true indicator of our success. Advenculturists, as we call them, are adventurous, creative, optimistic, and forward-thinking. Located nationwide, largely in urban cores, they’re avid travelers, but traditional travel destinations aren’t for them. They want genuine, rich, and deep experiences. For them, travel (and life) is about truly exploring stories – of people, cultures, local traditions, and rituals. Regardless of their length of stay, they want to uncover the story of a city. And then, share it with others. They’re drawn to experiences that offer a mash-up of outdoor adventure and cultural exploration that activates their intellectual, artistic, and athletic interests. Essentially, exactly what Seattle offers. More than anything, their thrill lies in anything intellectually stimulating. This was a truth that almost seemed too obvious when it came to travel. Most interesting is that this thrill isn’t just reflected in their travel behaviors, it’s reflected in their activities to their content consumption. One show our audience gravitated towards was The Amazing Race which wasn’t surprising given their love of travel and its recognition for being one of the more relatable and inspiring reality shows. But a conversation with CBS unlocked a more interesting insight. As a viewer, everyone assumes contestants have an amazing round-the-world adventure, soaking in culture from the various destinations. However, their mission to move so fast means they don’t actually “enjoy” or soak in the destinations they visit at all. A city with as much depth and texture as Seattle could change that dynamic. We invited three past couples from the show to compete in a different kind of race with the goal of seeing how much you can actually soak up within one city: Seattle. Because here, the more you dig in, the more you get out. 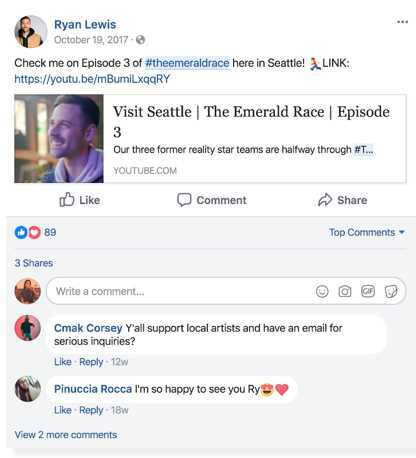 Each Monday an episode was released through VISITSEATTLE.tv with teasers run as pre-roll, mid-roll and native video on CBS.com, YouTube and social platforms to drive tune-in. Seattle is a city rich with textures, characters and soul. Here, the more you dig in, the more you get out. We were able to build on an already-popular cultural show and leverage it in a way that made it uniquely Seattle. 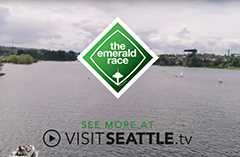 The Emerald Race quickly became one of our most watched shows on VISITSEATTLE.tv last year. The show garnered 2.4MM views in 4 months, with 50% of those coming from mobile devices. But more importantly, the show delivered over 8.4 million minutes of watch time, accounting for over 40% of our channel’s watch time for the year. Engagement in the series led to an incremental 18MM additional earned impressions. Time spent with the content on CBS properties was 4x the average, with visitors spending an average of 4 ½ minutes on the page. And our content earned over 5,000 positive engagements in social and reached over 7MM people through our talent’s social posts alone. 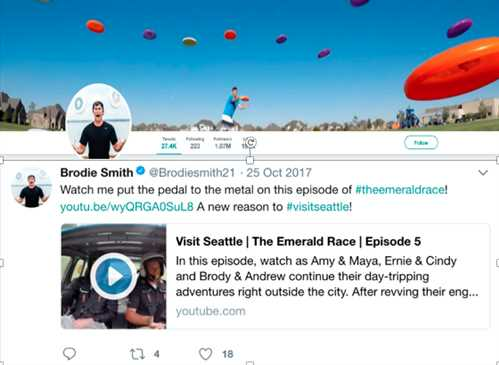 The success of this series contributed to triple the time spent on VISITSEATTLE.tv from the year prior as well as a total 19MM minutes of watch time across our channel. It also contributed to a record high business year for Visit Seattle, achieving record visitor numbers (+3.9% from year prior).